Roaring 21 presents itself as a casino haven with numerous slot titles, table games, specialty games, and video poker. Like its sister sites Casino Max and Cherry Jackpot, this online casino has a heavy focus on slot machines. The casino is powered by RTG (RealTime Gaming), which is a trusted, long-standing industry leader among online gambling software solution providers. Roaring 21's parent company is Entertainment Software Group N.V, a familiar name to those in the industry which extends credibility to this newly established casino. Here players can enjoy mobile gaming, competent customer support, a wide game variety, and reliable security. This platform provides plenty of bonuses and promotions to keep gaming lucrative for players. This brand's associated online casino sites can be examined also from our other online casino reviews. Roaring 21 has quickly become one of the top online casino game providers to many people across the globe, including USA players. Multiple bonus options coupled with a good selection of games and industry-leading software solutions make Roaring 21 Casino exactly what players are currently looking for. Their licensing in Curacao ensures legitimacy and that stringent licensing requirements and standards are adhered to. Is Roaring 21 A Trusted And Legitimate Site? This online casino destination is licensed by the Government of Curacao which is considered a trusted and legitimate licensor in the international gaming community. Numerous reputable online gambling providers retain licenses provided by Curacao justifying its jurisdiction as a safe and reliable licensor. Not only this, Roaring 21 commits to testing its RTG games and Random Number Generators on a monthly basis to receive fresh accreditation for fair and authentic gaming results. The casino’s license is considered legal and legitimate in the eyes of the United States and the international gaming community. Due to strict standards, licensees must maintain good-sanding to retain their Curacao gaming license. Real Time Gaming software is used to power Roaring21’s casino games. This brand is considered a longstanding entity in the business and is highly reputable as RTG supplies games for several notable brands and offers an extensive line of titles. The ESG N.V. company operating this casino has over 50 years of experience and knowledge in the industry which allows the company to lend knowledge and tips to Roaring 21. Licensing And Certifications - Is Roaring 21 Legal In The US? US players can legally gamble at Roarig21 due to their legitimate offshore licensing, regulation, and location according to free trade laws. There is no US federal law at this moment which directly prohibits domestic access of licensed offshore online gambling sites, therefore, US players do not have to worry about federally violating any laws when gambling here unless they live in Washington or Connecticut – two states which explicitly prohibit online gambling access. Learn more on our gambling laws page. Roaring 21 offers a 200% Welcome Bonus up to $10,000 for Slots, Keno, and Scratch Cards. This bonus allows players to claim a 200% match bonus up to $2000 on their first 5 deposits. There are game restrictions associated with this bonus offer. Another available Welcome Bonus is the 100% Welcome Bonus up to $1,000 to be used on Table Games, except Baccarat, Craps, Roulette, Sic Bo, and War. This Welcome Bonus can only be redeemed once but allows players to expand their gaming options and try new titles. Like its sister casinos, other bonuses include a 300% BTC Booster Bonus for Slots, a 200% Mastercard Bonus for Slots, and a 300% Instant Funding Bonus up to $3,000 when using Visa or MasterCard Powered Instant Funding for bankrolls, this can only be used for slot games. All Extra Special Bonuses are redeemable only once and maximum bonuses are 4x the maximum deposit limit on the chosen depositing method. Other promotions include a 70% Slot Bonus, their 60% Bonus on Other Games (excluding Baccarat, Craps, Roulette, Sic Bo & War), and Free Spin Frenzy with 40 Free Spins for Gemtopia and a 65% Bonus for Slots – all bonuses mentioned here are redeemable 5x per day. The software employed at this online casino site is Real Time Gaming. 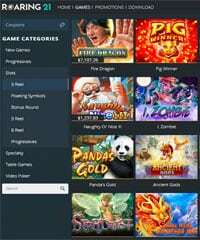 This software provider has supplied games for many of the most trusted casino destinations in the industry and with its long-standing record has created a substantial collection of beloved titles and games available for online casinos to choose from. Roaring 21 may specialize in Slots with over 190 slot titles, but other game types are also available such as blackajck, roulette, baccarat, war (among other table games), specialty games such as keno and scratchcards, and of course, video poker. Within each category are multiple variations of these games allowing for hours of entertainment. Roaring 21 uses the most secure programs, software, anti-virus protection, firewalls, and data encryption to ensure players’ personal, financial, and sensitive information is not compromised. They even extend their security protocols to be active when users send data from their personal computers to their site’s servers, thus protecting the site from being taken over by any undetected malware. US players may use credit and debit cards such as Visa, Mastercard, and American Express to fund their account. Minimum deposits for credit/debit cards are $35 and deposit maximums are at $500. Another method for Americans or international players to use is cryptocurrency which can come in handy if cards get declined. Bitcoin is currently the only cryptocurrency accepted at Roaring 21 with minimum deposits at $30 and maximums at $10,000. US players can use the latest Instant Funding method powered by Visa and Mastercard which gives “tokens” which can be used to fund bankrolls at this online casino. International players are provided with more depositing options like EcoPayz, NeTeller, and Skrill whose depositing minimums are set at $35 and capped at $1,000 for all three methods. Live Chat or Phone assisted depositing provides extra help for first-time online funders. US players have two withdrawal methods to choose from such as Bank Transfer (minimum $200, maximum $4,000) and Check Courier (minimum $200, maximum withdrawal $3,000), however, both withdrawal options have a $25 fee. International players have more withdrawal options like Visa, EcoPayz, NeTeller, Skrill, and Bitcoin – which have a maximum withdrawal set at $4,000 and a minimum at $35. These mins and maxes exclude Visa whose minimum is $100 for withdrawals. Thankfully, no fees are associated with these withdrawal methods for international players. IS ROARING 21 MOBILE FRIENDLY? Roaring21 works well with mobile devices which are either Android or iOS, as well as, Tablets, and iPads. Responsive design allows the site to translate its games and desktop experience onto a smaller mobile screen without losing functionality or usability. While the mobile platform is configured slightly differently it is not a learning curve to refamiliarize yourself with the mobile site. Things available on the desktop such as games, bankroll, assistance, favorites, and more are still accessible on these mobile devices. With this online casino being owned by ESG N.V there is a bit of credibility and reputation extended over. The ESG company has long operated in the industry and understands what players need and want. This experience of over 50 years can help guide the newly established Roaring 21 throughout its life online to better equip itself to meet new player standards and desires. The strong security, game selection, promotional bonuses, banking suite, and legitimacy influence our viewpoint to say that this is a reliable and safe brand for players to gamble at.